We’re in awe of the many talented indie designers who combine passion, skill, and a whole lot of math to turn an idea into a totally swoon-worthy pattern. Each month this is our space to show a little love to those who give so much joy to our making community. Discover stand-out designers, trending knitting patterns and free and exclusive indie patterns. What are you waiting for? Grab your crochet hook and discover a new designer today! A stunning blanket that will have everyone around you buzzing with delight! 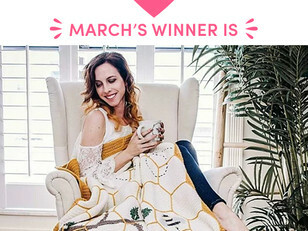 Vote for next month's pattern! There are so many amazing new designs uploaded to LoveCrochet each month, our 'Pattern of the Month' is an opportunity to shout-out to some of the ones we’re digging. Every month you’ll find a collection of 10 awesome patterns and we ask you to vote for your favorite! Just click through to the collection then click the little heart to vote. Meet some more designers and check out our favorite free patterns this month! Check out which indie designer patterns are hot and trending now! Like what you see? Check out some of our most popular indie designs!